Cupcakes 'n Daisies: Twister Update . . . . I found it funny that several folks are exactly like me, bought those twister templates but never did anything with them! I received this red and cream "Lil Twister" project for Christmas last year, so some folks are using their twister rulers. 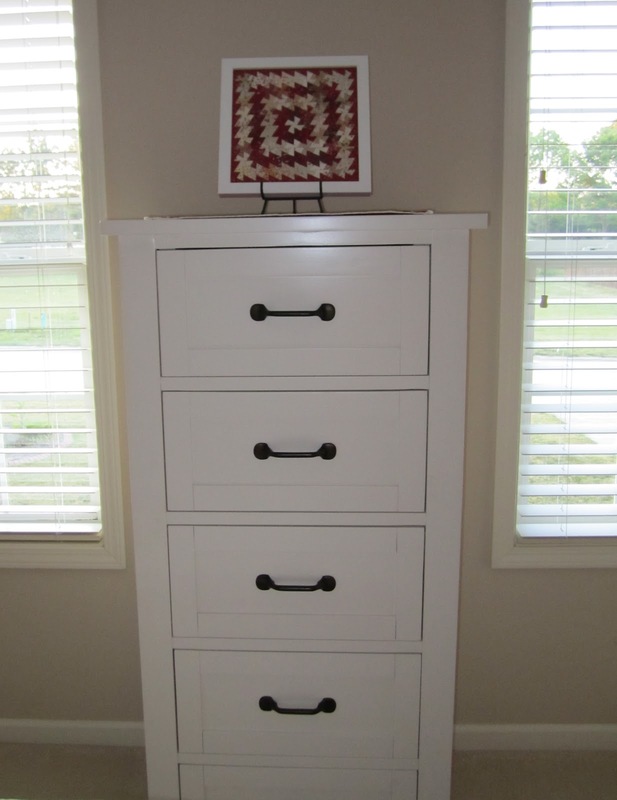 It matches my guest room decor and looks perfect on top of this dresser. I included this shot to give you a better perspective of the size. Besides the comments saying "I bought one of those and have never used it" I got a very helpful email from Dawn at First Light Designs. Dawn teaches Twister classes and was nice enough to send her class handout with Twister secrets and a couple of pictures of one of her Twister projects. Dawn and I both agree on the following , the Twister template, very clever and easy to use, the Twister books, not so helpful. - the corners of each square of fabric are what you will see in the finished project, so pay attention to the them and the fabrics next to them. - the amount of contrast that you see before you use the twister template is greatly reduced after the pieces are cut and sewn back together. - experiment with scraps before cutting first project. 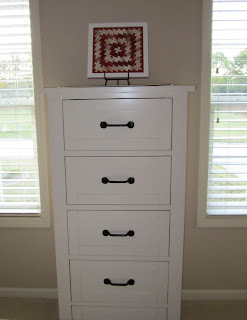 Here's a picture of Dawn's pieced project before using the Twister. And here is what that made! 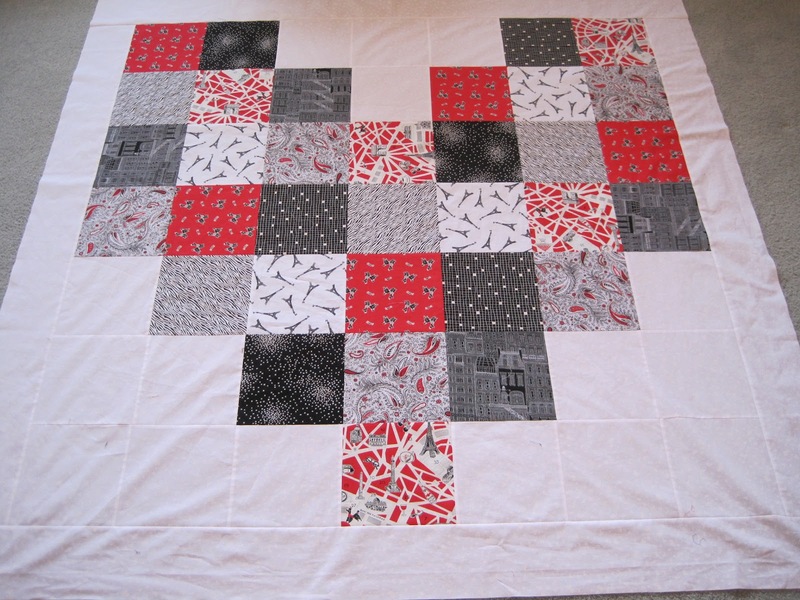 Dawn named this project "I love Paris" I really love the row of tiny twister blocks at the base of the heart, a great touch. 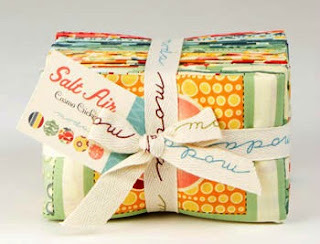 I'm planning on using Salt Air by Cosmo Cricket for Moda for my project. The print is a little big on some of the fabrics in this line, but I'm going with the Twister, not the Lil Twister, so hopefully it will all work out! Stay tuned, or better yet, get your Twister out and see what you can make! Very nice, love the look of your quilt. Looks nice on the dresser and you really get the size of it. Great job. I think I have 3 different sizes of Twister, and have used one...does that count? I love your red and white twister, and Dawn's heart is really nice. I can't wait to see how it turns out! I have the large ruler, but have only made 4 of the other sizes so far. I've made a couple of twister quilts and find them to be fun. I agree that small prints work best. I have the lil twister too and just used it not too long ago. I made new couch pillows out of my trial run. It came out cute. I would love to learn how to do different layouts with the template. the heart is a great layout. 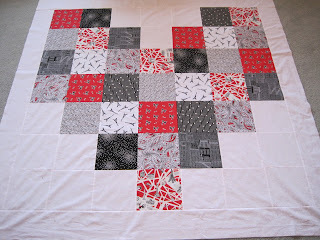 Do you know where I can find that layout or is it in the twister pattern book? One other "tip" that I found helpful ~ when you start cutting the squares using the Twister ruler, use a smaller rotary cutter with a sharp blade ~ a 45mm instead of a 60mm, and a 28mm if you're using the itty bitty versions. The smaller size will give you a little more control when stopping and starting, and that will help you not cut too far past the end of the template. There's a bit of "extra" between the squares so you can go a little past it but you don't want to go way past it. I haven't made anything with the bigger Twister rulers but I love the two small ones... the teeny tinys. I have all four sizes (the large and small plus the two itty bitty) and have used all but the large so far and love using them! 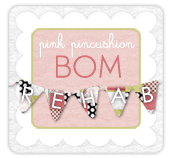 My finished projects can be found on my blog if you'd like to check them out. Your quilt is adorable as is the heart by Dawn! Look forward to seeing your Salt Air quilt when it's done. That's very cool! Wondering if you're going to be singing "Let's twist again, like we did last summer" :) Sorry, couldn't help it! I too have bought the twister templates. I haven't purchased the books because I read on enough blogs that they were not that helpful. 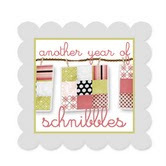 I am a little hesitant to try them so I'll either make a few sample blocks or see if there is a class around here. That is if I can find my templates, fabric, etc. in all the packing! I love the heart. Very clever. Can't wait to see what spin you put on yours because I know you will!!! Dawns project IS amazing. I'm impressed. I have the large twister template and have used it a couple of times. 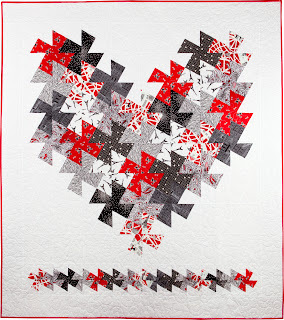 I like the heart one, and might look for the charm size template for future quilts. Thanks for sharing. must be too early in the morning to post.LOL I cant spell! Love the pattern. I do not have the template or the book but I am intrigued. LOVE LOVE LOVE the heart! Beautiful! Thanx for the tips; I have got to use mine. I just received the little ones from Primative Gatherings. I can't wait to try them out. They use 2 1/2" & 3 1/2" squares. The smallest template finishes at 1".